Father Jim Pace was celebrant and preacher for the Solemn Mass on Sunday, November 18, 2018. When the 1979 Prayer Book was being prepared, the Standing Liturgical Commission made a deliberate choice to avoid the title “Christ the King” for the last Sunday of the church year. For us, it was simply “The Last Sunday after Pentecost.” There was a good reason for that. This commemoration was instituted by Pope Pius XI for the Roman Catholic Church on December 11, 1925, in his encyclical, known by its Latin title, Quas primas —the link will take you to the official English translation. Originally appointed to be celebrated on the last Sunday of October, in the 1969 reform of the Roman Catholic liturgy the commemoration was moved to the last Sunday of the liturgical year. Steve Potanovic was reader for the Solemn Mass. Given that the feast was originally about who should govern the peoples of the world (presumably the bishop of Rome), other Christian churches did not rush to embrace the commemoration. Since the army of the kingdom of Italy entered Rome on September 20, 1870, the bishops of Rome considered themselves “prisoners of the Vatican.” It’s worth noting that in December 24, 1925, Italy’s Fascist prime minister received the title “His Excellency Benito Mussolini, Head of Government, Leader of Fascism and Founder of the Empire.” The Lateran Treaty, signed on February 11, 1929, would establish the Vatican City as an independent city-state. The lordship of Jesus Christ is rooted in the historical reality of his life. He is the incarnate Majesty of the Holy Trinity—words we use not to control or limit our understanding of God, but words we can use with the confidence that God has revealed God’s self with these words. The kingship of Christ, if we want to use that term, begins with his incarnation and has no ending. It’s rooted in the events of his earthly life, in the words from my favorite Christmas hymn, “born to raise the sons of earth, born to give them second birth.” We already have two feasts anciently associated with Christ’s kingship, the Epiphany and Ascension Day. Father Jay Smith was gospeller. YOUR PRAYERS ARE ASKED FOR Ricardo, Kenny, Jondan, Michelle, Paul, Frank, James, MaryHope, José, Eloise, Michael, Alexandra, Karen, Susan, Marilouise, Greg, Timothy, Barbara, Dennis, Abraham, Randy, Burton, May, Heidi, Takeem, David, and Sandy; and Horace, Gaylord, Louis, and Edgar, priests; and all the benefactors and friends of this parish. GRANT THEM PEACE . . . November 25: 1897 DeFrancais Folsom; 1906 Theresa Blust; 1914 Eliza Fanio Verplanck Richardson; 1918 Bertha Grotz; Herman J. Stoeppler; 1965 Henry F. Wise. THE ORDINARY FRIDAYS OF THE YEAR are observed by special acts of discipline and self-denial in commemoration of the Lord’s crucifixion. HOSPITALITY MINISTRY AT SAINT MARY’S . . . Gathering in Saint Joseph’s Hall for fellowship following Mass on Sundays and Solemn Mass on holy days is an important part of our community’s life. It is a ministry that is not without its costs. The cost of food and beverages is significant. We welcome donations to help cover these costs. Please consider making a regular monthly donation to support this ministry. You may also make a donation to cover the costs of a single holy-day reception. We have been spending around $500 for each reception. Donations may be sent by mail to the parish office. Checks should be paid to the order of the Church of Saint Mary the Virgin. Payment by credit card may also be made by contacting the parish office. We are grateful to all those who support Saint Mary’s so generously. Gifts of food for Saint Clement's Church Pantry are received at all Sunday services. ADVENT QUIET DAY . . . Saturday, December 15, 9:30 AM–3:00 PM. Led by Brother Thomas and Brother Damien, the Quiet Day will be centered around the stories of Advent. Using icons depicting scenes from the narrative of the Advent season, participants will be invited to engage in a guided process of discussion and prayer meditation. Using the process of lectio divina in the context of icons, participants will have the opportunity to explore the images and texts of the stories of the Annunciation, the Visitation, and the Nativity in hopefully a new and prayerful way. The brothers will be discussing the use of icons, some of the symbolism within each image, and then lead the participants through the lectio divina process for each image. All are welcome. A donation of $10.00 to cover the costs of breakfast and lunch is gratefully received. Please RSVP by sending an e-mail to Father Jay Smith. CHRISTIAN EDUCATION . . . Sundays in November at 10:00 AM, Father Peter Powell will lead the class in a discussion of the Elijah/Elisha cycle in 1 Kings 16:23–2 Kings 13:25 . . . Sunday, December 2 and 9, at 10:00 AM, resident iconographer, Zachary Roesemann leads the class in a discussion of the theology of the Incarnation in light of some of his recent work. The Adult Forum meets in Saint Benedict’s Study . . . The Adult Forum will begin its Christmas break on Sunday, December 16. Classes will resume on Sunday, January 13, at 10:00 AM . . . The Wednesday Night Bible Study Class meets next on November28 at 6:30 PM, following Evening Prayer. The class is reading the Letter of James and is led by Father Jay Smith. On November 28, we begin our reading at James 2:14. AROUND THE PARISH . . . The annual Christmas Tree Lighting Ceremony at Rockefeller Center will take place on Wednesday, November 28, at 7:00 PM: a busy day in the neighborhood . . . We hope to receive donations for altar flowers on the following dates: Sunday, January 13, 20, and 27, February 10, 17, 24, and March 3. If you would like to make a donation, please contact the parish office . . . Father Jay Smith will be away from the parish on retreat from Thursday evening, November 29, through Sunday, December 2. He returns to the parish office on Monday, December 3 . . . Attendance: Last Sunday 189, Thanksgiving 50. Marie Postlewate led the Prayers of the People. FROM THE MUSIC DIRECTOR . . . The musical setting of the Mass on Sunday is the Missa Simile est regnum caelorum of Tomás Luís de Victoria (1548–1611). Victoria is considered the most important Spanish composer of Renaissance polyphony. Born in Avila, the seventh of eleven children, he began his musical education as a choirboy at Avila Cathedral, and began his classical education at San Gil, a Jesuit school for boys founded in 1554. By 1565, Victoria had entered the Jesuit Collegio Germanico in Rome, where he was later engaged to teach music and eventually named maestro di cappella. Victoria knew and may have been instructed by Palestrina (1525–1594) who was maestro di cappella of the nearby Seminario Romano at that time. During his years in Rome Victoria held several positions as singer, organist, and choral master and published many of his compositions. He was ordained priest in 1575 after a three-day diaconate. There are twenty authenticated Mass settings of Victoria in addition to two Requiems. The Missa Simile est regnum is one of Victoria’s twelve parody masses in which he quotes musical ideas from pre-existing musical composition. In this case, Victoria’s musical quotes are from a motet by his friend and contemporary, Franciso Guerrero (1528–1599). Guerrero’s motet on Matthew 20:1–4 likens the Kingdom of God to a landowner justly hiring laborers for his vineyard. Victoria’s Mass skillfully reutilizes distinctive melodic features of Guerrero’s motet, such as the rising perfect fifth which begins most of its movements. With the exception of the Benedictus in three voices, Victoria’s Mass, like Guerrero’s motet, is voiced in four parts. However, the final Agnus Dei spectacularly employs two choirs of four voices each which sing in strict canon. Sunday’s motet at Communion is a setting of Psalm 92:1–4 by David Hurd, organist and music director at Saint Mary’s. This anthem for voices and organ was composed in 1973 and sung at the Chapel of the Intercession, Harlem (now Church of the Intercession), in the first season of Dr. Hurd tenure as director of music there. It is a work of modest length, modeled loosely after Sir William McKie’s We wait for thy loving kindness (Psalm 48), composed for the marriage of Her Royal Highness Princess Elizabeth in 1947 at Westminster Abbey. As in Sir William McKie’s anthem, a tenor announces the opening psalm verse in simple unaccompanied melody at the outset and also repeats this same text near the end of the anthem as it were an antiphon. Sunday Solemn Evensong & Sermon concludes with Eucharistic Adoration & Benediction. OUTREACH AT SAINT MARY’S . . . Donations and volunteers are needed for our next Drop-in Day on Wednesday, November 28, and for the many requests for assistance between Drop-in Days. We are in particular need at the moment of warm hats, gloves, and packs of clean, new socks. Please contact Brother Damien Joseph, SSF, if you would like to volunteer for this important ministry or if you would like to make a donation . . . We continue to receive nonperishable food items for our outreach partner, Saint Clement’s Food Pantry. Please place those items in the basket near the ushers’ table at the Forty-sixth Street entrance to the church. We are very grateful to all those who continue to support this ministry. 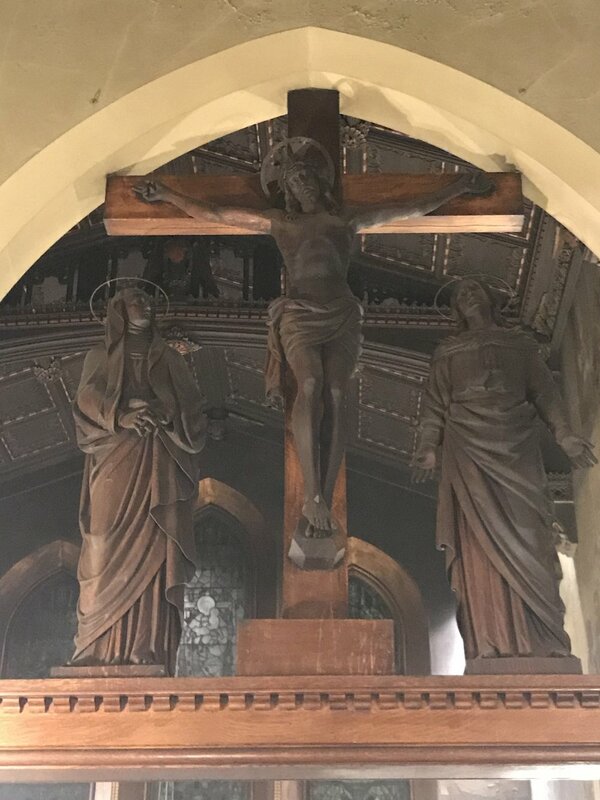 The Rood Beam from Saint Mary's first church home, 228 West 45th Street, was moved to our second and present church home in 1895. THE VISUAL ARTS AT SMV . . . The Third Annual Latinx Art Fair: DR/PR Collects, Supporting Dominican and Puerto Rican Artists, will take place in the Gallery in Saint Joseph’s Hall on Friday, November 30, 5:00–9:00 PM and Saturday, December 1, 12:00–6:00 PM. LOOKING AHEAD . . . Sunday, December 2, First Sunday of Advent . . . Friday, December 7, Eve of the Conception of the Blessed Virgin Mary, Organ Recital 5:30 PM, Solemn Mass 6:00 PM . . . Wednesday, December 12, The Anniversary of the Dedication of the Church, 1895 . . . Sunday, December 16, The Third Sunday of Advent: The O Antiphons begin . . . Friday, December 21, Saint Thomas the Apostle, Mass 12:10 and 6:20 PM . . . Monday, December 24, Christmas Eve, Music for Choir and Congregation 4:30 PM and Sung Mass 5:00 PM; Music for Choir and Congregation 10:30 PM and Solemn Mass 11:00 AM … Tuesday, December 25, Christmas Day, Solemn Mass 11:00 AM. CLICK HERE for this week’s schedule. CLICK HERE for the full parish calendar.